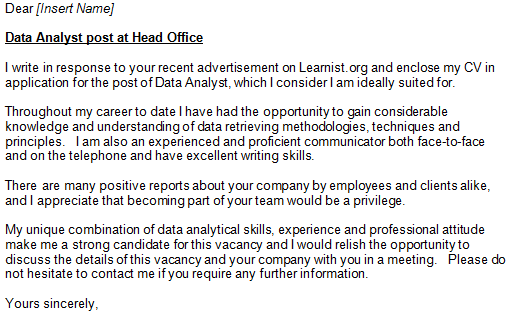 Here is a free covering letter example of Data Analyst job. It’s possible to use this letter for any other IT jobs as well. Remember to edit this sample before using your job application. Insert your name, address and all other contact information such as email and telephone numbers. Did you knoow that there are many IT and Data Analyst jobs out there but there is a lack of qualified personel? So if you think your qualifications would make you a good employee for any company then why not apply for vacancies on this site or on job sites online such as CV Library, Learnist.org, Monster.com, Totaljobs.com etc. Good luck with your job hunting and please let us know what do you think about these sample letters by commenting via form below and if you want us to write a cover letter for you then click here to visit our job forum. I write in response to your recent advertisement on Learnist.org and enclose my CV in application for the post of Data Analyst, which I consider I am ideally suited for. Throughout my career to date I have had the opportunity to gain considerable knowledge and understanding of data retrieving methodologies, techniques and principles. I am also an experienced and proficient communicator both face-to-face and on the telephone and have excellent writing skills. There are many positive reports about your company by employees and clients alike, and I appreciate that becoming part of your team would be a privilege. My unique combination of data analytical skills, experience and professional attitude make me a strong candidate for this vacancy and I would relish the opportunity to discuss the details of this vacancy and your company with you in a meeting. Please do not hesitate to contact me if you require any further information.